Do you live in one of Facebook´s biggest cities? Find out thanks to our statistics! If you were supposed to guess which city in the world has the most Facebook users, which one would it be? Mexico city, New York, Tokyo or perhaps Las Vegas? According to Socialbakersstatistics, if Facebook was a country, its capital city would be Bangkok! 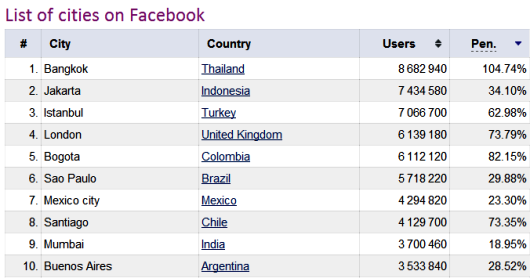 Thailand has over 14.6 million Facebook users which makes it the 16th biggest Facebook country in the world! It grew by more than 1.3 million users in the last 6 months, mainly thanks to people between 25 to 34 years old. The Facebook penetration in Thailand is 22.01% compared to the country's popu­lation and 83.60% in relation to the number of Internet users. Jakarta and Mumbai are also dominating the ranking, which only support´s the idea of Asia becoming the next biggest Facebook continent after North America if it continues to expand. While India is continuing in its growing trend, Indonesia has lost just a bit over half a million Facebook users in the last three months. Facebook represents a huge potential market for your social media efforts, but it is becoming increasingly difficult to stand out from the crowd. The following statistics highlight some relevant Facebook facts and can ultimately help you to navigate it better, increasing your return on investment (ROI) and leading to greater marketing success. Download our Valuable Facebook Statistics non-branded presentation. Worldwide, there are over 1.65 billion monthly active Facebook users (MAUs) which is a 15 percent increase year over year. (Source: Facebook as of 4/27/16) What this means for you: In case you had any lingering doubts, statistically, Facebook is too big to ignore. 1.09 billion people log onto Facebook daily (DAU) for March 2016, which represents a 16% increase year over year (Source: Facebook as 4/27/16) The Implication: A huge and vastly growing number of Facebook users are active and consistent in their visits to the site, making them a promising audience for your marketing efforts. There are 1.51 billion mobile active users (MAU) for March 2016 (Source: Facebook as of 4/27/16) an increase of 21 percent year-over-year. Facebook users are 76% female and 66% male. (Source: Brandwatch – https://www.brandwatch.com/2015/01/men-vs-women-active-social-media/) The Takeaway: Since this isn’t a large statistical difference, you should be able to effectively reach both genders on Facebook. Every 60 seconds on Facebook: 510 comments are posted, 293,000 statuses are updated, and 136,000 photos are uploaded. (Source: The Social Skinny) The Implication: Again, there are a lot of engaged and active users, but also a huge amount of information competing for their attention, so quality and strategy on your part matter. Thought to take with you: At 1.49 billion, Facebook has more monthly active users than WhatsApp (500 million), Twitter (284 million) and Instagram (200 million)—combined. (Source: CNBC) Facebook continues to reign in popularity over other social media channels. Why do we say so ..
Center of Everything. Four Points by Sheraton Bangkok, Sukhumvit 15 is a new upscale Bangkok hotel with easy access to the business district and the city's major shopping and entertainment areas. Plus, we're conveniently located in the heart of the city just off Sukhumvit Road, only 5 minutes walking distance from Asok Station, the interchange station for the skytrain and subway. Comfort, Value and Great Food. Our 268 stylish guest rooms and suites guarantee a good night’s sleep on the super plush FourPoints Four Comfort™ Bed. Refuel in one or all of our fresh and fun restaurants and bars including a casual beer bar, an exclusive rooftop bar with views of Sukhumvit, and an all-day dining restaurant offering international cuisine. Little Things Mean So Much. We keep you connected with family, friends and business, with free wireless High Speed Internet Access in our guestrooms, lobby and public areas. Burn some energy in the 24-hour fitness center or cool down in the outdoor swimming pool. Many more Simple Pleasures(SM) await you at Four Points by Sheraton Bangkok, Sukhumvit 15.